It's that time of year to go through the house and clean EVERYTHING! Spring Cleaning can be a challenge especially if you want to avoid nasty chemicals. Grab Green's innovative, delightfully simple products are healthier, non-toxic, and safer than leading brands, while being effective and scientifically proven to perform. Their eco-responsible formulas are sold in reduced recyclable packaging and convenient, pre-measured packs. They are also suitable for all water temperatures and cycles. Grab Green does not use animal testing, whatsoever, and all of their products are made without dyes, glycols, phosphates, 1,4-dioxane, chlorine, DEA, formaldehyde, caustics, or optical brighteners. Grab Green products are available in fragrance free (perfect for those with allergies) and beautifully balanced fragrances that are handcrafted from essential oils. Free from harsh chemicals, Grab Green Bleach Alternative Pods are laundry boosters and pre-treaters that help make colors brighter and whites whiter while removing stains and neutralizing odors. They may also be used to clean grout and remove carpet stains! Starting 4/10 - shop at Target to save 10% on Grab Green, but hurry offer expires 4/23 (no coupon code required). Want to save another 50%? If you email a copy of your Target receipt to support@GrabGreenHome.com they will send you a 50% coupon to be used on http://www.grabgreenhome.com/. 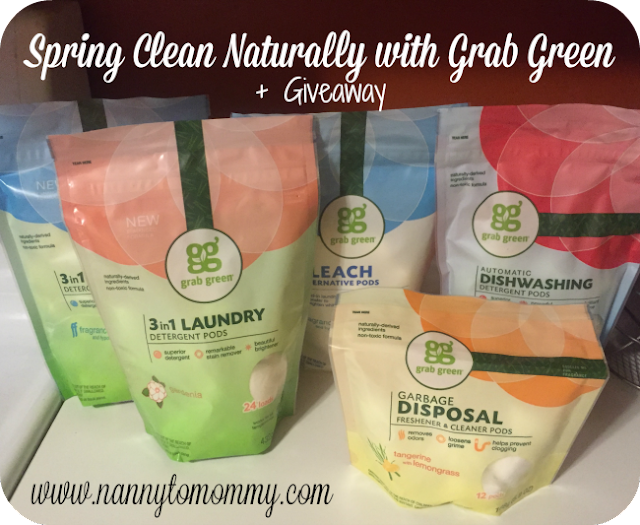 One very luck Nanny to Mommy reader will win the same kit I received from Grab Green, RV $35! Entry is simple, just follow the prompts on the Rafflecopter below. Open to US only, must be 18+ to enter. Make sure to follow us on Facebook so you can stay up to date with our current giveaways. Good luck! As you may or may not know, April is Earth Month. This is the month where we try conserve, reuse, recycle, and think more about our effect on the planet. To celebrate, The Anti-June Cleaver and Our Piece of Earth have teamed up with an amazing group of bloggers to bring you the Earth Day giveaway hop where you will have the chance to win lots of great natural and eco-friendly prizes! As always, after you have entered a giveaway visit the linky at the bottom of each post to visit the other blogs for more great prizes. I received this product for free from the sponsor of the Moms Meet program, May Media Group LLC, who received it directly from the manufacturer. As a Moms Meet blogger, I agree to use this product and post my opinion on my blog. My opinions do not necessarily reflect the opinions of May Media Group LLC or the manufacturer of this product. Facebook, Twitter, Pinterest and any other social media are not affiliated with this giveaway. Nanny to Mommy received complimentary products to provide this review and giveaway. Nanny to Mommy is not responsible for sponsors who do not fulfill prize obligations. This giveaway is open to US only, must be 18+ to enter. Cannot be shipped to P.O. boxes. One entry per household/IP address. No social media was involved in this giveaway in any way. Winner is chosen via Random.org through Rafflecopter. ALL winning entries ARE verified. Winner will have 48 hours to respond with all information in email or another winner will be chosen. If you would like to see your product featured on our blog or sponsor a giveaway event, please contact us. 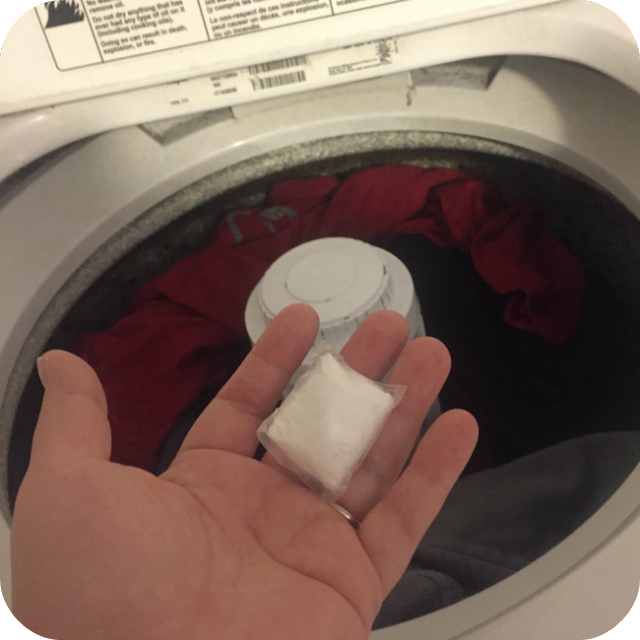 I would like to try Grab Green products because they are free of harsh chemicals, naturally derived,good for our environment and works great on laundry. Thank you for the opportunity! 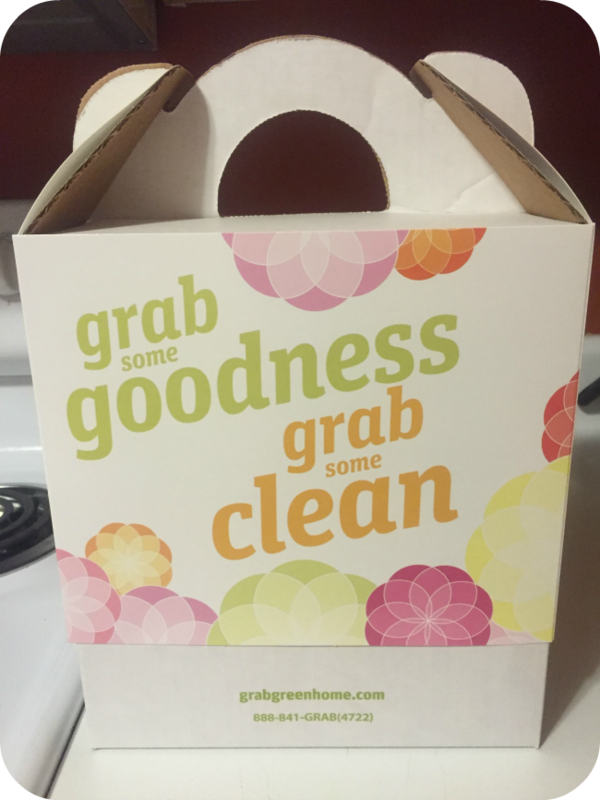 I want to try Grab Green cleaning products, because I like to use things that are better. Without all the bad things in them. I think all natural products are better for my home and RV, I also feel it is better for my family and pets. Id love to cut down on the chemicals we are exposed to in our home!! Cleaning products are a great way to do that!! I want to try Grab Green cleaning products for natural cleaning strength. I want to grab green products because I love products that don't have harmful ingredients. This kit does not have all the harmful chemicals that most things have in them to get your house clean. I wnat to win The Grab Green cleaning kit beacuse they are All natural products that are not harmful to the environment, my pets, or my family! We have a little dog and my daughter often has health problems. These would be safer for them both. I would love to try them seeing they are natural and it would be better for my family! I hate using chemicals while I clean, so natural methods sound like a great idea. I would like to try Grab Green cleaning products because I will not use products with harmful chemicals anymore, it gives me a headache if I do. These products look terrific and effective. I would love to try Green Grab products because they are much safer, healthier and non-toxic!! I really like the easy grab pods, and the fact that they do no testing on animals! It's great that their containers are made using recycled materials! I use all green cleaning products now because i found taht the traditional high chemical content ones a.) don't even work that well and b.) sometimes make me a little sick from the fumes. I like using natural cleaning products so I would like to try these. I'm trying to go green. I just changed light bulbs and want to move my way to cleaning products. I would be so proud of myself. I want to try it since I'm concerned about harmful chemicals! I want to try something new thats why. I like how the guide lets you know how to impress. It shows full hacks and how to get the job really done. I have not tried these products before to clean but it seem like good cleaning products, gotta try it, thanks for sharing.